San Francisco Review of Books: Book Review: Borderless Economics: Chinese Sea Turtles, Indian Fridges and the New Fruits of Global Capitalism, by Robert Guest. 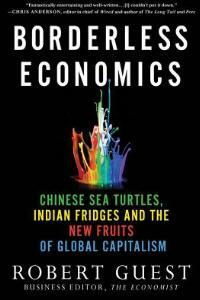 Book Review: Borderless Economics: Chinese Sea Turtles, Indian Fridges and the New Fruits of Global Capitalism, by Robert Guest. Robert Guest, Business Editor of The Economist, travels the world to make the case for the positive effects of migration and international connections, in a readable, wide-ranging new book on globalisation. Amusing, intelligent, and full of statistics, Borderless Economics is the perfect starting point for exploring new diasporas and international networks, finds Dr Kate Saffin. Borderless Economics: Chinese Sea Turtles, Indian Fridges and the New Fruits of Global Capitalism. Robert Guest. Palgrave Macmillan. November 2011. Robert Guest’s previous book The Shackled Continent (2004) explored the economics of Africa and presented a case for free-market capitalism to be whole-heartedly embraced by the continent. His latest book, Borderless Economics, looks at the positive impact that globalisation and the movement and migration of people around the world has on our lives. Guest uses North Korea as an example of a country in isolation, without free movement of people or ideas, and cites this isolation as an important factor in the country’s poverty and its appalling rates of child mortality, literacy levels, and even its people’s average height. Guest looks at the Indian and Arab diasporas, among others, and how they affect the process of goods that we all consume, but for him the real prize is China. Guest finds that it is the Chinese diaspora that drives their homeland’s economic growth, and believes the diaspora “promises to turn the worlds last great dictatorship in to a democracy.” Guest fills a chapter with interesting, detailed anecdotes about migrants who fled China and made money by engaging with the old country, and how others in China are benefiting hugely from greater global connections. Guest is intrigued by the concept of Hiagiu, or sea turtles, which refers to foreign-educated Chinese people who go back to China, taking with them knowledge, business contacts and new ideas. It’s a bold concept but Guest believes that these returnees will be the supporters and enablers of the democratization that is craved by China’s people. He makes a brief mention of ‘sea turtles’ who have come back, not convinced by democracy at all, and have written best selling books about it. He also mentions how many ‘sea turtles’ stay away from politics when they get home, fearing the powerful Communist Party and the repercussions of any dissent. Guest does pause to take a look at some of the darker elements of migration and international tribal networks and devotes a chapter to hate crimes and terrorism, dealing with the Rwandan genocide, Al-Qaeda attacks, and Nigerian scams. It is quite an anthropological aside from the rest of the book, but this consideration of the other side of migration is done extremely well, drawing on Guest’s journalistic talents. Towards the end of the book we learn where Guest’s heart lies: the USA. Guest is an ardent Atlanticist and firmly believes that migrants will continue to find America the most attractive option for both upward mobility and the ability to find niche lifestyles. For this reason Guest believes that America “will remain the dominant power in the world for far longer than people expect” and that it is and will continue to be the hub of a connected planet. The book is written in a chatty, more journalistic than academic, style, stuffed with anecdotes and jokes, which may make the reader engage more with the text but can wear a little thin. Too many paragraphs are littered with sometimes meaningless statistics and figures. Guest makes a lot of valid points and could have relied on his own prose now and again without these crutches, especially when dealing with more philosophical politics. It may have also been useful and given the book a bit more depth if the author had lingered over some of the counter-arguments and alternative political and economic evidence a little longer. The sociological and economic effects of migration and international networking are likely to become increasingly important and relevant with time. In 2009, 215 million people were living outside the country in which they were born: that is 3 per cent of the world’s population, and Guest writes that these individuals “tend to be more dynamic and driven than those they left behind.” It’s easy to picture Guest’s migrants arriving in their new home clutching a copy of The Economist, with a Twitter account and an internet start-up underway. Although of course the majority of migrants are not like this, Guest is certainly right that migrants are important to both their new and old home economies and are often prepared to work hard and contribute a lot. New diasporas and international networks, in all their guises, need to be thought about and engaged with, and Borderless Economics can give the reader a jumping off point from which to start. This review was first published on the LSE British Politics and Policy blog on 29th January 2012. Dr Kate Saffin has worked as a medical doctor in London, Sydney and Paris and is a qualified General Practitioner. Most recently she completed the Masters in Public Health at King’s College London and has subsequently worked for a think tank and as a freelance researcher in public and health policy. Her research interests lie in international development and the intersections between health, the environment, economics and politics. Read more reviews by Kate.